Summer 2019 - Booking Fast! 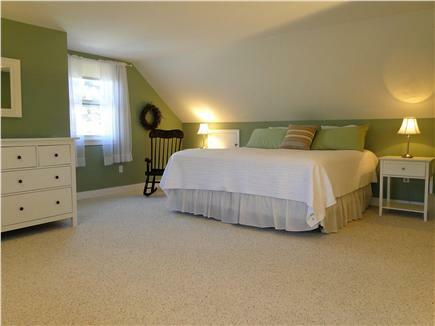 Upstairs king bedroom – largest bedroom! Visit Lighthouse beach, great for walks! 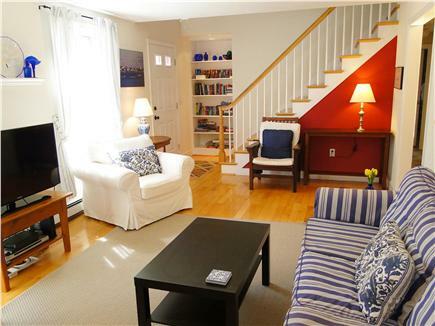 Enjoy our wonderful vacation home, located within walking distance to Chatham's Main Street, Fish Pier, ''A's'' Baseball, bike path and beaches. The house is on a quiet dead end street with a wonderful private backyard. The outdoor shower is great after a day at the beach, then sit on the back deck and enjoy dinner on the New! gas grill. 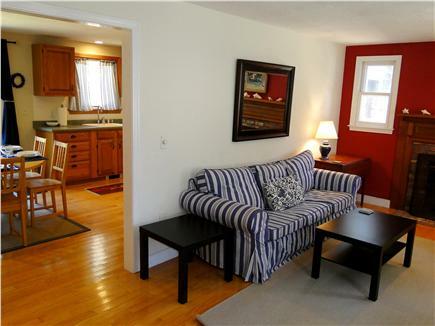 The home is comfortable and nicely furnished with a fully equipped kitchen (new plates, flatware and cookware 2016. New Glassware, Linens, Tile Shower, A/C upstairs and windows 2017, interior painted 2018/19). This is a well cared for home! We travel quite a bit ourselves and know what makes a great vacation! We've equipted our home to be what we'd expect as renters. Our goal is provide a place you can make memories and will want to return to again and again! This is a really wonderful place: clean, casual, private and quiet! Check our guest reviews for more information. With two bedrooms and a full bath on each floor our home is perfect for any type of family or group of friends. The house is almost 2,000 square feet, so it is bigger than it looks from the outside photo! Additional availability info: Open to long term off-season rental. Tenant must vacate by May 15 th 2019. Additional pricing info: Cleaning Fee and Linens included in Price. Security Deposit and Lease required. State and local taxes of 12.45% will apply. This was a perfect house for us. It had everything we needed in a terrific location. We spent most of our time outside on the deck and in the yard The owner was incredibly kind, accommodating, and responsive. We hope to return. Peaceful, Perfect size home to very nice owners! 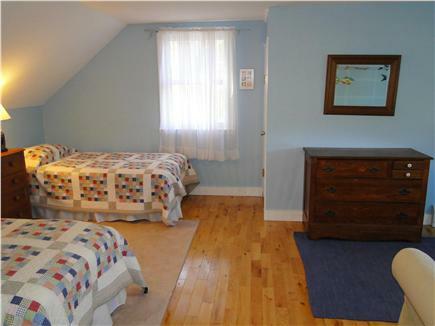 This home has 4 very generous size bedrooms which was great for my family of 6. There was more than enough room. I loved that the linens/towels were included so we didnt have to pack up all that extra stuff! The house is clean and neat and decorated with style & is tucked away at the end of a quiet dead end street where your surrounded by mature lush trees giving lots of privacy. The property manager came by to make sure we didnt have any questions and was helpful when we did. My family has been vacationing on the Cape for over 20 years. We like to move around and rent different places. 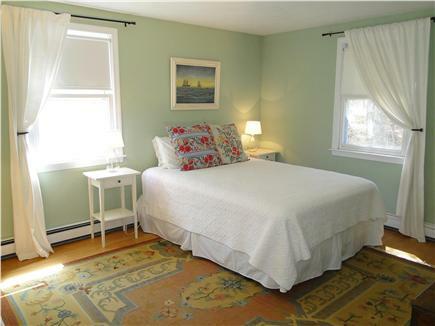 Chatham has always been one of our favorite places to stay and doing so here made for a great vacation. Jennifer's home was lovely and comfortable. There was plenty of room for our family - we especially loved the hammock in the back yard. The newly installed air conditioning in the bedrooms is a great addition. We walked into town several times during the week. The home is located on a cul de sac, so it's very quiet and no traffic. Jennifer was great to deal with and especially helpful when we forgot some items at the home! Quaint, comfortable cottage in great location! 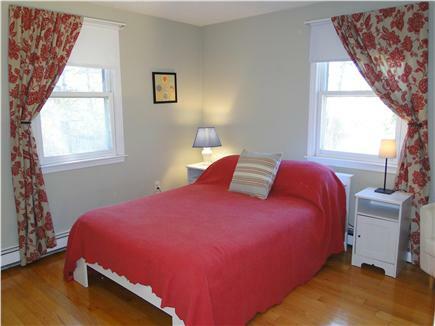 Walking distance to Main Street in Chatham, short drive to grocery stores and the beach. Great backyard for entertaining and relaxing on the hammock. The home is air conditioned and is very comfortable. 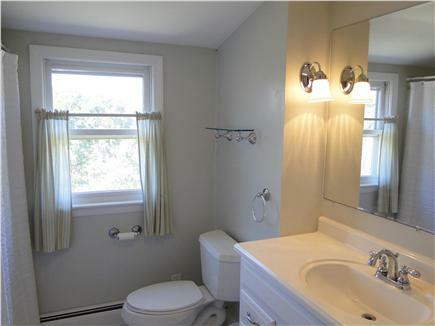 The bathrooms have been recently renovated as well. We will definitely stay here again. Thank you, Jen, for sharing your beautiful Chatham home with us during our vacation in the US this summer. We are a family of 5 who travelled from Ireland, and the extra space in this house was really appreciated. The setting is brilliant - Field Street is quiet yet it is within walking distance of bustling Chatham with its great bars and restaurants. The kids loved the wildlife, and the daily visit by a family of wild turkeys was great fun. Quiet, Convenient, Family Friendly, Spacious, Clean & Well Kept! 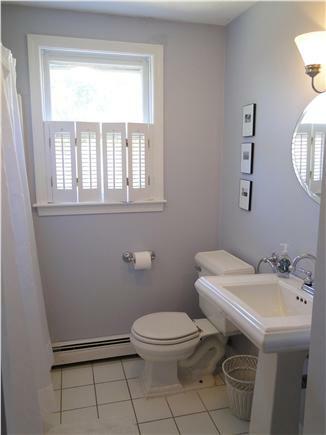 We just returned from our very first trip to the Cape a week or so ago--we had a great vacation (all the way from Chicago) and found all the amenities of home in this rental. Jen was very accommodating--even purchasing a blender for the home at our request. Upon arriving, Jen had also had purchased new cookware, plates, and slipcovers for a few of the chairs. A perfect example of the home being well kept! We ran out of propane and her father dropped off a new tank, pronto! 2 bedrooms up and 2 bedrooms down--and a full bathroom on each floor--perfect for two families or in our case our immediate family of 3 and grandparents. Washer and dryer was especially useful! Little extras included children's toys, board games, book, beach chairs, umbrella & beach toys--especially nice for a family traveling by plane and not wanting to haul all of the extras! 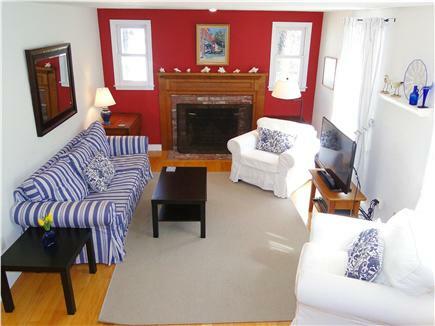 Location is walkable to downtown Chatham--about 15 minutes. Same distance to Oyster Pond, great children's beach. We walked all over--downtown to lighthouse beach, to the Chatham Village Bakery. However, be warned that we are walkers--accustomed to walking to a downtown area, for some this might be too far. Autumn is the best time to be in the Cape! I absolutely loved this house - the rooms were extremely spacious and comfortable!! The owner answered all my questions very quickly. My family enjoyed our vacation so much. 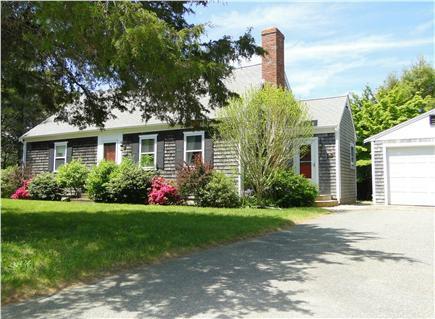 I have rented many times in Chatham, and this house goes on my top of list. This will be our third year staying in this wonderful home. My family has vacationed in Chatham for the past 20 years and stayed with family, but as our family grew, we needed a place of our own. We knew exactly where in Chatham that we wanted to stay. This home exceeded our expectations. 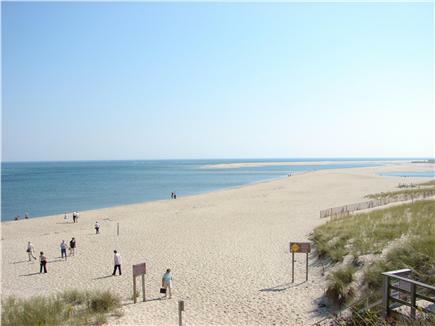 The location is perfect as you can walk to the fish pier, shore road, main street, the ball field and of course a short drive to Lighthouse Beach and close to Route 28 so you can easily travel to many of the other beaches in the area. As I said, the house is perfect as we have 7 adults and having 4 bedrooms, 2 full baths, and outdoor shower - it is very spacious. We love that it is on a dead-end street so it is very quiet and private. 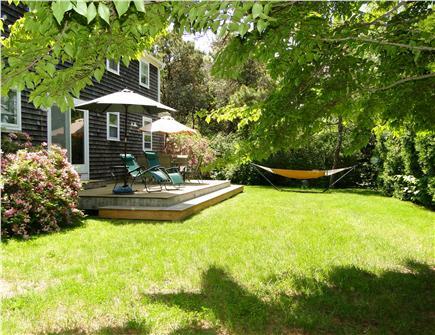 It has a very private back yard where we love to sit and relax after a long day at the beach. When we come home from the beach - we can unload in the breezeway where there is enough room to store the beach stuff or make use of the washer and dryer.